Natick is UNITED and we stand together. We will not tolerate hateful or discriminatory acts of any kind. We will not allow any fellow resident to be discriminated against, harassed, mistreated or excluded based on gender, race, class, religion, ethnicity, sexual orientation, gender identity, learning style, abilities or political party. Further, Natick Police are committed to enforcing the law against anyone committing a hate crime against one of our residents or visitors to our community. Should a hate crime be committed, it will be thoroughly investigated; and, if proven, will be prosecuted to the fullest extent under local laws or federal laws, whichever is most appropriate. Natick is UNITED and we stand together. We are a caring and supportive community where all are welcome. Our community is made up of a diverse group of residents of different backgrounds, religions, genders, cultures, political beliefs, races, ethnicities, gender orientations and identities, opinions and life experiences. Though we are different, we are ONE NATICK FAMILY where all are welcome. 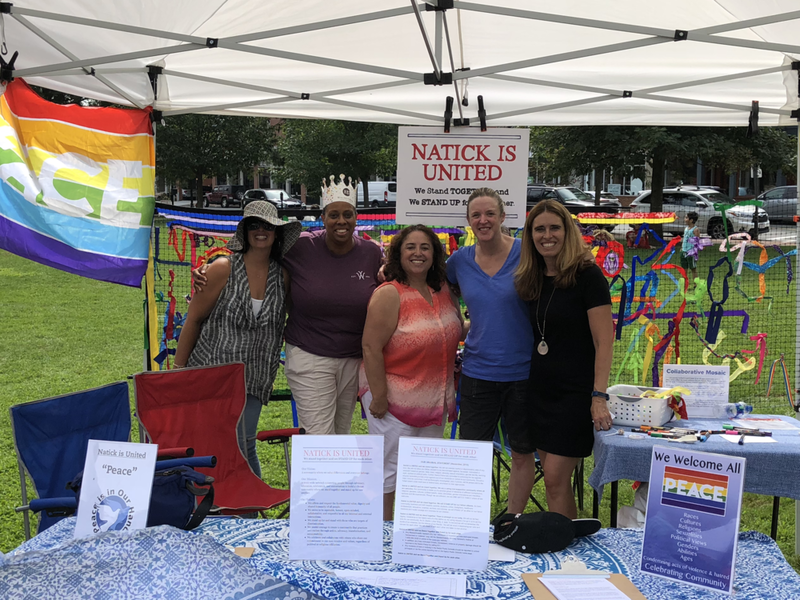 Natick is UNITED and we stand together. We will STAND UP for our fellow citizens. As town, community, business and faith leaders, parents, students, police, firefighters, healthcare professionals, educators, coaches, workers, and citizens, we will STAND UP as allies for our fellow residents and model courage and kindness for our children. Natick is UNITED and we stand together. There is strength in our unity. We will not let fear, bigotry, intolerance or the hateful acts of a few define us. As caring citizens, it is up to us to set the tone for our community. As Dr. Martin Luther King, Jr. said: “In the end we will not remember the words of our enemies, but the silence of our friends.” We will be vocal in expressing our care and concern for each other. We will check in with each other and listen to one another. Natick is UNITED and we Stand Together and Stand Up for each other. Potential Hate Crimes - including bias-motivated assault, battery and property damage - should also be reported directly to the Natick Police Department as soon as practical. Residents who fear for their immediate safety should call 911 immediately. Any incidents of bias or bullying in the Natick Public Schools should be reported to school principals or via the online reporting link on the Natick Public Schools home page.